Each season inspires a different beauty routine and that of course, includes haircare as well. In the summer I use serums, dry shampoo, curl defining products, you name it. I need effective products that can rid my hair of residue without stripping its natural oils. I've been using the Unwash Try Me Kit with three innovative products to get my hair clean and hydrated in a whole new way. The Try Me Kit includes three products - the Bio-Cleansing Conditioner, Anti-Residue Cleanse, and Hydrating Masque. The Bio-Cleansing Conditioner gets used every time you wash your hair. It takes the place of both your shampoo and conditioner. While this product does not lather, it thoroughly cleans the hair without being harsh or irritating. Cleansing conditioners definitely take some getting used to, but I love anything to simplify my routine. The Anti-Residue Cleanse gets used once a week or whenever you need an extra deep cleaning. This cleanser is a gel-like consistency, more like a typical shampoo. It lathers and gets deep down to remove any residue. After it is rinsed out, it feels like you just used a shampoo so you will feel like you need some extra conditioning. That's where the Hydrating Masque comes in! The Hydrating Masque follows the Anti-Residue Cleanse to replenish moisture and balance hair. It's a thick, creamy consistency like most other hair masks. You simply coat hair from roots to ends and let it sit for about four minutes. I like how fast this mask works while giving the results of a nourishing, deep conditioning treatment. My hair is left silky smooth without feeling heavy or weighed down. This is probably my favorite of the three products! These products are safe for all hair types, including color treated hair. They are free of parabens, sulfate detergents and harsh chemicals. 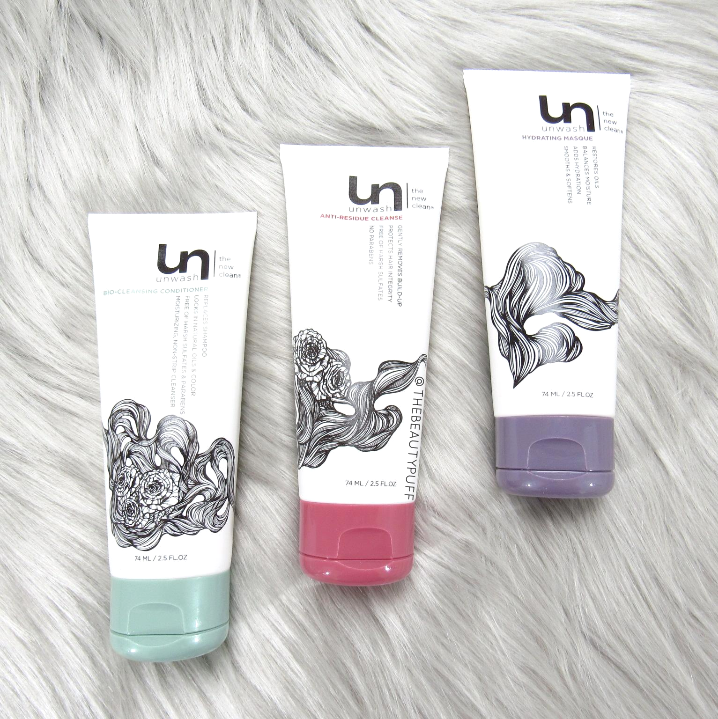 You can find the Unwash Try Me Kit on their website below, along with the entire Unwash line.